Street art is transient by its nature. This site has been a well known and much loved site for two murals by street artist Blu, in conjunction with JR. In 2008, Blu created a giant mural of 2 masked figures, with the eyes designed by JR. Their hands formed the gang signs for east and west and they seemed about to pull each other’s masks off. The wall next to the masked figures soon acquired another Blu mural, this time of a business man sporting gold watches as cufflinks. The area changed gradually, with the vacant spot in front of the murals turning into the home of artists, refugees and the homeless. The art changed too. A few years after the original creation, the eye section was modified to add goggles and blank out the eyes. In 2014, with discussions and planning requests underway to turn this area into an office block, Blu and colleagues decided it was time for another statement, and blacked out the art works. Both artwork and accommodation for many were both transient, and construction work is now well underway. There were attempts to preserve these pieces as public art but the artists chose to make a statement about the changes in Berlin society. You can read about their reasons here. To see the work before blackout, click here. 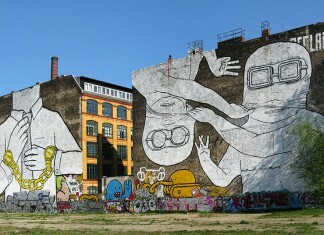 I also recommend the book Street Art in Berlin by Kai Jakob. Jakob has used the masked figure mural as the cover throughout the, so far, 7 editions of this book. Great photos and a good choice of content Debbie.